I have a softener, but since adding a resevoir, my water has turned yellowish with precipitated iron. Currently, well goes directly into 1100 resevoir, from the resevior it goes to a 80 gallon pressure tank, from tank into the softener and the softener into a 20 carbon filter. The carbon filter plugs up quick and the softener doesn't deal with the iron well. I am new to this and tired of dealing with flakey water companies and want to go on my own. What would you recommend for a system using what I already have but ideally getting rid of the 20 inch filter? The water has both iron and manganese, so a type of iron filter that can handle both iron and manganese is needed. From your description I assume your reservoir is a non-pressurized covered tank, such as a 1100 gallon polyethylene plastic storage tank? And that after the storage tank you have a booster pump and 80 gallon pressure tank, is that correct? If so, you are a good candidate for a MangOX iron filter. MangOX (also sold as Filox, or Pyrolox) is a solid manganese oxide media that is very effective at removing both dissolved (clear) and oxidized (rust) iron, as well as manganese, from water. The MangOX filter can go right before the softener, and you would not need to use a 20" carbon filter. Instead, you can use a dual-grade 25/1 micron sediment filter, which holds much more sediment than a carbon filter. You might want to keep the 20" filter housing in place in case you ever want to add a filter cartridge after the iron filter and before the softener, however, the MangOx does a great job at removing sediment, too, so it's not likely that a cartridge filter will be needed. It's important to note that the effectiveness of these systems is dependent on the size of your home; the systems mentioned here are best for homes with 1-3 bathrooms. 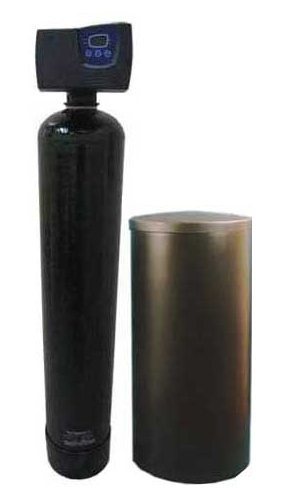 The MangOX Iron Filter is a powerful and effective system for removing iron and manganese from well water. 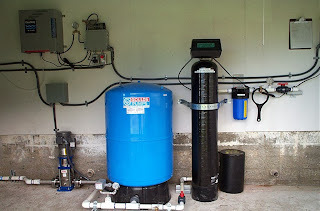 This system automatically removes iron, manganese, and sediment without the use of filter cartridges or chemicals. 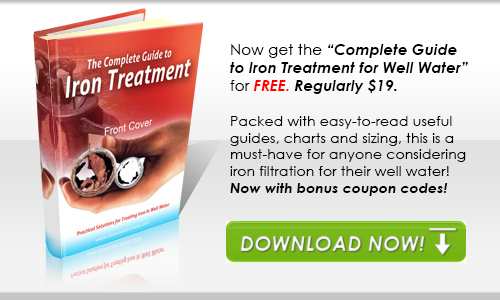 The iron filter is easy to install by any plumber or person familiar with basic plumbing. The MangOX Iron Filter works by using a special type of solid manganese oxide media which traps the iron and then automatically backwashes the trapped rust and sediment out to drain. The backwash lasts for approximately 15 minutes and takes place automatically, typically every 2 - 3 days, in the middle of the night when no water is being used. An optional chlorine solution tank is available to backwash the MangOX filter media with a chlorine rinse, which kills iron bacteria and can extend the life of the MangOX media for many years. For waters containing “rotten egg odors” (hydrogen sulfide), a chlorine feed ahead of the MangOX filter can be used to kill the odor and keep the MangOX media in working condition. Unlike many residential and small commercial iron filters, the MangOX 7000 system will not restrict flow rate or cut down on water pressure in the home. 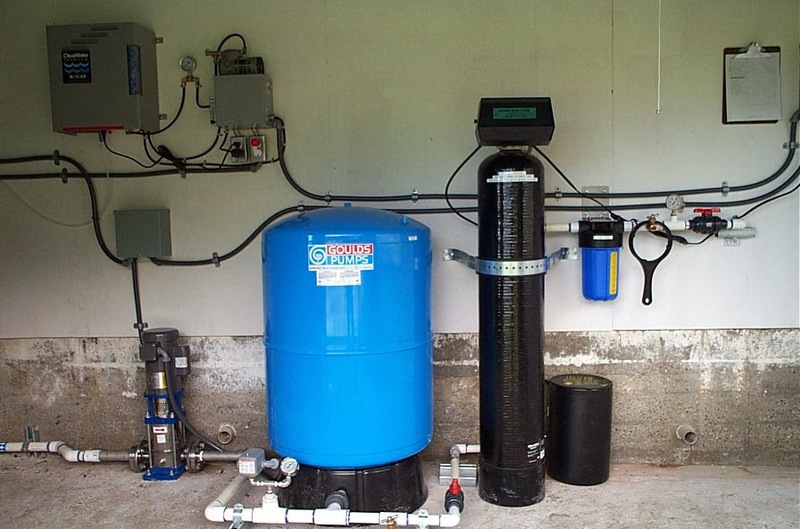 The system uses a high-quality Vortech filter tank which requires less backwash water, saving water and energy. The MangOX media also lasts for more than 10 years, unlike the media inside the Greensand and Birm iron filters, which generally must be changed every 3 to 5 years. Enjoy scale-free fixtures and appliances with soft water. No more dry skin or dry hair caused by excess minerals in the water! Save money by using less soap and laundry detergent and extend the life of your water heater, appliances, and clothes with soft conditioned water from the Fleck 7000-SXT on-demand softener. Well-designed and reliable, the Fleck 7000SXT Electronic Meter-Demand Valve provides larger 1-1/4" internal ports for the best flow rates and least pressure drop, making this valve perfect for use in larger homes with 1", 1-1/4", or even 1-1/2" plumbing. No matter what size home you have, you'll see less pressure drop through this softener than through other residential softeners. The new 7000-SXT softener uses less salt by monitoring the amount of water used in the house and regenerating only when necessary. The system keeps time electronically, so the drive motor only runs during regeneration, saving energy and lasting longer than other softeners with standard timer motors. Plus, if there is a power failure it can keep the correct time for up to 48 hours. Here is a diagram of a typical installation. These systems are designed to be easily installed by any plumber or person familiar with basic plumbing. Congrats on taking the first step toward installing and operating your own clean water system. Let us know how it goes. Thanks again for the e-mail.